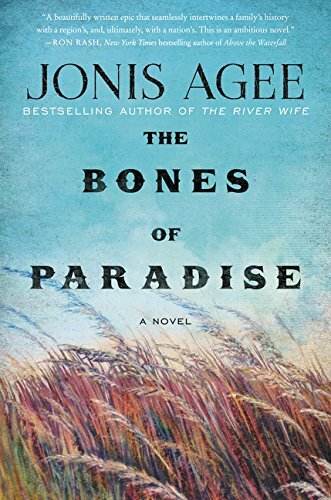 The finest western novel since Lonesome Dove, Jonis Agee’s The Bones of Paradise is an epic saga with elements of a Greek tragedy. Set in the Sand Hills of Nebraska, The Bones of Paradise provides a panoramic view of the West in transition as 20th century presents new challenges to ranchers seeking to survive drought, economic downturns, and the unforgiving nature of the land. Ten years after the massacre at Wounded Knee, J. B. Bennett, a member of one the region’s oldest ranching families, discovers the hastily buried body of a young Sioux girl. Before J. B. can make any sense of what killed the girl, and why she might be buried on his land, he is also murdered. The bodies of J. B. and the Indian girl are discovered by Ryland Graver, a failed homesteader who has watched helplessly as his wife and children die of starvation as drought and the uncompromising environment of the Sand Hills slowly strangle his attempts at farming. Ryland survives the death that took his family, and riding a toothless old plow horse, plans to go as far as his horse will take him before it dies. The animal makes it as far as the two bodies lying close together by the windmill. Then a bullet kills the horse and wounds Ryland. J. B.’s murder brings the Bennett family to the ranch: Drum Bennett, J. B.’s father; his estranged wife, Dulcinea; and his two young sons, Cullen and Hayward. Accompanying Dulcinea is Rose, a young Sioux woman and Dulcinea’s friend. Unknown to the Bennetts, the young girl in the shallow grave is Star, Rose’s sister. Rose intends to find Star’s murderer and kill him. So does Dulcinea, because whoever killed Star also killed her husband. Neither woman knows who the killer might be, but each has a list of suspects. Drum Bennett is one of the nastiest villains in recent fiction, worse in many ways than a serial killer, because while he feels no charity or liking for any man, he saves his most poisonous venom for his own family. “Drum was a man who hit first and didn’t talk later.” His own generosity was how frequently he beats his grandson, Cullen, who lives with him. Both J. B. and Dulcinea had made separate bargains with Drum. They would have been better served making bargains with the devil and signing their names in blood. J. B.’s bargain breaks his wife’s heart and destroys his family. Dulcinea’s bargain leads to her abandoning her husband and sons. In death J. B. avenges himself on his father by leaving his ranch to Dulcinea and his two sons. Drum is incensed and begins to plot how he can cheat his daughter-in-law and grandsons. “He hoped to God he didn’t have to sink so low as to kill a woman.” His reluctance has nothing to do with regard for Dulcinea, but killing a woman is beyond the pale even for Drum. Unless murder is the only way. Fate intervenes, and Drum breaks his ankle, which means he must stay at J. B.’s headquarters despite the fact that Dulcinea wants the old man gone. An argument ensues between the two, and Drum falls and breaks an arm. Dulcinea has no better luck with her two sons. Cullen hates her, a result of J. B.’s bargain with Drum, and Hayward is cold toward her because she abandoned him as a child. Despite her sons’ dislike, she makes another devil’s bargain with Drum, this one to gain clear title to the ranch. The massacre at Wounded Knee is the back story, the reason behind the murders of Star and J. B, and author Agee describes the battle between the army and the Indians from the viewpoints of J. B. and Ryland, both of whom were witnesses. The strongest character in The Bones of Paradise is not a person, but the Sand Hills, and Agee so eloquently describes them, that one can felt the grit of blowing sand against one’s face. The Sand Hills are as impersonal and cruel as Drum, and as lovely and enticing as Dulcinea. The Bones of Paradise is everything a Western novel should be: a setting that challenges men and women to survive, a love of the land that as strong as that for one’s family, and a story as strong and harsh as the land itself.